After the conquest of the land and the death of that great leader Joshua, the tribes of Israel settled into the chaotic, disjointed, and disorganized period described in the Book of Judges. This whole time period of nearly four centuries was characterized by the repeated descriptive phrase, "In those days there was no king in the land, everyone did what was right in his own eyes." (Judges 17:6, 18:1, 19:1, 21:25) Failure to drive out and exterminate the corrupting Canaanites who lived previously in the land caused these peoples to grow back like poisonous weeds until they oppressed and harassed Israel. During this time God graciously raised up "judges" (shophetim) who reversed the status quo for a season by calling on God and rally the people around the One who had chosen them and commissioned them to occupy the land. Then all the elders of Israel gathered together and carne to Samuel at Ramah, and said to him, "Behold, you are old and your sons do not walk in your ways; now appoint for us a king to govern us like all the nations." But the thing displeased Samuel when they said, "Give us a king to govern us." And Samuel prayed to the LORD. And the LORD said to Samuel, "Hearken to the voice of the people in all that they say to you; for they have not rejected you, but they have rejected me from being king over them. According to all the deeds which they have done to me, from the day I brought them up out of Egypt even to this day, forsaking me and serving other gods, so they are also doing to you. Now then, hearken to their voice; only, you shall solemnly warn them, and show them the ways of the king who shall reign over them." So Samuel told all the words of the LORD to the people who were asking a king from him. He said, "These will be the ways of the king who will reign over you: he will take your sons and appoint them to his chariots and to be his horsemen, and to run before his chariots - and he will appoint for himself commanders of thousands and commanders of fifties, and some to plow his ground and to reap his harvest, and to make his implements of war and the equipment of his chariots. He will take your daughters to be perfumers and cooks and bakers. He will take the best of your fields and vineyards and olive orchards and give them to his servants. He will take the tenth of your grain and of your vineyards and give it to his officers and to his servants. He will take your menservants and maidservants, and the best of your cattle and your asses, and put them to his work. He will take the tenth of your flocks, and you shall be his slaves. And in that day you will cry out because of your king, whom you have chosen for yourselves; but the LORD will not answer you in that day." But the people refused to listen to the voice of Samuel - and they said, "No! but we will have a king over us, that we also may be like all the nations, and that our king may govern us and go out before us and fight our battles." And when Samuel had heard all the words of the people, he repeated them in the ears of the LORD. The first king chosen, Saul of the tribe of Benjamin, a son of Kish - though a man of proven military ability - failed the tests God gave him and was soon disqualified (1 Samuel 15) leaving the newly formed "monarchy" in a state of civil war. Young David, a Bethlehemite shepherd lad from the tribe of Judah was then chosen by God. As everyone knows, he proved by his wise choices to be a man "after God's own heart." As a great military strategist David united the tribes and extended the national boundaries so that in his time Israel enjoyed a greater fraction of the land promised to Abraham than has ever since been the case. David ruled as king for seven years and Hebron, then established his throne in Jerusalem after overcoming the ancient Jebusite (Canaanite) community there. His reign continued there in Jerusalem for the next 32 years. Secure on his throne and dwelling in a magnificent palace of cedar and stone, David began to be concerned that he, the visible king, dwelled in a magnificent house, but the invisible King of kings still dwelt in an aging temporary tent, the Tabernacle of Moses. At first the prophet Nathan gave David approval to construct a temple, but the following night God intervened. Speaking to Nathan in a dream God laid out for David an amazing covenant whose promises continue to this present day. God committed himself to establishing the house of David forever, to a specific land and people (Israel), and to a temple (see 2 Samuel 7). Messiah, in fact, would be one of David's sons. David, a man of war, was not, however, to build the First Temple. That task was given to his son Solomon, although David drew up the plans. 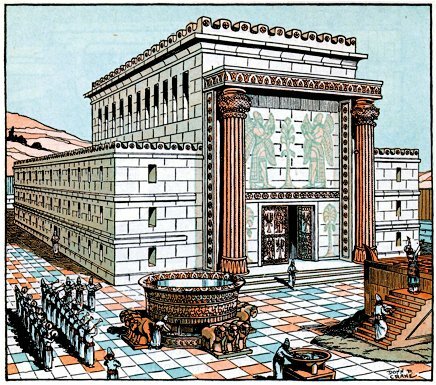 The fact that other nations had temples and Israel did not is not the reason The First Temple was to be built. The Temple was to be a memorial to Israel to turn her heart away from the idols of the surrounding nations. The Temple would provide them for an incentive not to practice the same evil things as the Canaanites. After the Temple was built, the Tabernacle was dismantled. It may have been stored in a room under the Temple Mount. It is quite possible it is still there to this day, as many rabbis and authorities in Jerusalem believe. David was by no means a perfect king. He had a number of wives and his marriages were apparently nothing to boast about. His grievous sin of murder and adultery in the case of Bathsheba brought war in David's household for the rest of his days. Yet when confronted with his sin David showed contrition and repentance (Psalms 32, 51 for instance). Late in his reign David carelessly chose to take a census of the army acting against the advice of General Joab and other army leaders. The Lord was provoked to great anger at David who evidently had forgotten that the strength of Israel was in her God and not in the number of her soldiers or skill in battle. Confronted with the seriousness of his poor judgment by the prophet Gad, David was given three choices by God as to the consequences that were to follow this serious mistake on the part of the king. The three choices given him were (1) three years of famine, (3) three years of devastation by Israel's foes, or (3) of three days of destruction (pestilence) wrought by The Angel of the Lord, (see 1 Chr. 21, 2 Sam 24 for the accounts). Knowing that God was merciful, David asked God to choose. The result was three terrible days of pestilence from the Angel of the Lord. Jerusalem was spared at the last minute when David cried out for mercy--the sin was his and not that of the people--they were but sheep. It was at this time, when the hand of the Angel of the Lord was stayed, that David was told by Gad to erect an altar on the threshing floor of Araunah (Ornan) the Jebusite. The location was on wind-swept Mount Moriah. The site is the place where one thousand years earlier God had stopped Abraham from sacrificing Isaac. And Gad came that day to David and said to him, "Go up, erect an altar to the Lord on the threshing floor of Araunah the Jebusite." . . . And David built there an altar unto the Lord, and offered burnt offerings and peace offerings. So the Lord heeded the prayers for the land, and the plague was withdrawn from Israel. (2 Samuel 24: 15,1 6, 18, 25). David commanded to gather together the aliens who were in the land of Israel, and he set stonecutters to prepare dressed stones for building the house of God. David also provided great stores of iron for nails for the doors of the gates and for clamps, as well as bronze in quantities beyond weighing, and cedar timbers without number - for the Sidonians and Tyrians brought great quantities of cedar to David. For David said, "Solomon my son is young and inexperienced, and the house that is to be built for the LORD must be exceedingly magnificent, of fame and glory throughout all lands; I will therefore make preparation for it." So David provided materials in great quantity before his death. "My son, I had it in my heart to build a house to the name of the LORD my God. But the word of the LORD came to me, saying, You have shed much blood and have waged great wars; you shall not build a house to my name, because you have shed so much blood before me upon the earth. Behold, a son shall be born to you; he shall be a man of peace. I will give him peace from all his enemies round about; for his name shall be Solomon, and I will give peace and quiet to Israel in his days. He shall build a house for my name. He shall be my son, and I will be his father, and I will establish his royal throne in Israel for ever.' Now, my son, the LORD be with you, so that you may succeed in building the house of the LORD your God, as he has spoken concerning you. Only, may the LORD grant you discretion and understanding, that when he gives you charge over Israel you may keep the law of the LORD your God. Then you will prosper if you are careful to observe the statutes and the ordinances which the LORD commanded Moses for Israel. Be strong, and of good courage. Fear not; be not dismayed. With great pains I have provided for the house of the LORD a hundred thousand talents of gold, a million talents of silver, and bronze and iron beyond weighing, for there is so much of it; timber and stone too I have provided. To these you must add. You have an abundance of workmen: stonecutters, masons, carpenters, and all kinds of craftsmen without number, skilled in working gold, silver, bronze, and iron. Arise and be doing! The LORD be with you!" David also commanded all the leaders of Israel to help Solomon his son, saying, "Is not the LORD your God with you? And has he not given you peace on every side? For he has delivered the inhabitants of the land into my hand - and the land is subdued before the LORD and his people. Now set your mind and heart to seek the LORD your God. Arise and build the sanctuary of the LORD God, so that the ark of the covenant of the LORD and the holy vessels of God may be brought into a house built for the name of the LORD." You know that my father David could not build a house for the name of the Lord his God because of the wars which were fought against him on every side until the Lord put his foes under the soles of his feet. (1 Kings 5:3). Then King Solomon raised up a labor force out of all Israel - and the labor force was thirty thousand men . . . Solomon selected seventy thousand men to bear burdens, eighty thousand to quarry stone in the mountains, and three thousand six hundred to oversee them. (1 Kings 5:13; 2 Chronicles 2:2). In the four hundred and eightieth year after the people of Israel came out of the land of Egypt, in the fourth year of Solomon's reign over Israel, in the month of Ziv, which is the second month, he began to build the house of the LORD. The house which King Solomon built for the LORD was sixty cubits long, twenty cubits wide, and thirty cubits high. The vestibule in front of the nave of the house was twenty cubits long, equal to the width of the house, and ten cubits deep in front of the house. And he made for the house windows with recessed frames. He also built a structure against the wall of the house, running round the walls of the house, both the nave and the inner sanctuary - and he made side chambers all around. The lowest story was five cubits broad, the middle one was six cubits broad and the third was seven cubits broad - for around the outside of the house he made offsets on the wall in order that the supporting beams should not be inserted into the walls of the house. When the house was built, it was with stone prepared at the quarry; so that neither hammer nor ax nor any tool of iron was heard in the temple, while it was being built. The entrance for the lowest story was on the south side of the house; and one went up by stairs to the middle story, and from the middle story to the third. So he built the house, and finished it; and he made the ceiling of the house of beams and planks of cedar. He built the structure against the whole house, each story five cubits high, and it was joined to the house with timbers of cedar. Now the word of the LORD came to Solomon, "Concerning this house which you are building, if you will walk in my statutes and obey my ordinances and keep all my commandments and walk in them, then I will establish my word with you, which I spoke to David your father. And I will dwell among the children of Israel, and will not forsake my people Israel." So Solomon built the house, and finished it. He lined the walls of the house on the inside with boards of cedar; from the floor of the house to the rafters of the ceiling, he covered them on the inside with wood; and he covered the floor of the house with boards of cypress. He built twenty cubits of the rear of the house with boards of cedar from the floor to the rafters, and he built this within as an inner sanctuary, as the most holy place. The house, that is, the nave in front of the inner sanctuary, was forty cubits long. The cedar within the house was carved in the form of gourds and open flowers; all was cedar, no stone was seen. The inner sanctuary he prepared in the innermost part of the house, to set there the ark of the covenant of the LORD. The inner sanctuary was twenty cubits long, twenty cubits wide, and twenty cubits high; and he overlaid it with pure gold. He also made an altar of cedar. And Solomon overlaid the inside of the house with pure gold, and he drew chains of gold across, in front of the inner sanctuary, and overlaid it with gold. And he overlaid the whole house with gold, until all the house was finished. Also the whole altar that belonged to the inner sanctuary he overlaid with gold. In the inner sanctuary he made two cherubim of olive wood, each ten cubits high. Five cubits was the length of one wing of the cherub, and five cubits the length of the other wing of the cherub; it was ten cubits from the tip of one wing to the tip of the other. The other cherub also measured ten cubits; both cherubim had the same measure and the same form. The height of one cherub was ten cubits and so was that of the other cherub. He put the cherubim in the innermost part of the house; and the wings of the cherubim were spread out so that a wing of one touched the one wall, and a wing of the other cherub touched the other wall; their other wings touched each other in the middle of the house. And he overlaid the cherubim with gold. He carved all the walls of the house round about with carved figures of cherubim and palm trees and open flowers, in the inner and outer rooms. The floor of the house he overlaid with gold in the inner and outer rooms. For the entrance to the inner sanctuary he made doors of olive wood; the lintel and the doorposts formed a pentagon. He covered the two doors of olive wood with carvings of cherubim, palm trees, and open flowers; he overlaid them with gold, and spread gold upon the cherubim and upon the palm trees. So also he made for the entrance to the nave doorposts of olive wood, in the form of a square, and two doors of cypress wood; the two leaves of the one door were folding, and the two leaves of the other door were folding. On them he carved cherubim and palm trees and open flowers; and he overlaid them with gold evenly applied upon the carved work. He built the inner court with three courses of hewn stone and one course of cedar beams. In the fourth year the foundation of the house of the LORD was laid, in the month of Ziv. And in the eleventh year, in the month of Bul, which is the eighth month, the house was finished in all its parts, and according to all its specifications. He was seven years in building it. ...Solomon built God a house. However the Most High does not dwell in temples made with hands, as the prophet says: "Heaven is My throne, and the earth is my footstool. What house will you build for Me? says the Lord or what is the place of My rest? Has not My hand made all these things?" (Acts 7:47-50, quoting Isaiah 66:1-2). The Temple was built to meet the limitations and needs of God's people. It emphasized the way of salvation to the those who asked His forgiveness and represented the believers assurance of the grace of God for their joy and blessing. (1 Kings 8:27-30). Yet regard the prayer of Your servant and his supplication, O Lord my God, and listen to the cry and the prayer which Your servant is praying before You today: that Your eyes may be open toward this temple night and day toward the place of which You said, "My name shall be there," and that You may hear the prayer which Your servant makes toward this place. (1 Kings 8:28-29). Moreover concerning a foreigner, who is not of Your people Israel, but has come from a far country for Your name's sake. (for they will hear of Your great name and Your strong hand and Your outstretched arm), when he comes and prays toward this temple, hear in heaven Your dwelling place, and do according to all for which the foreigner calls to You, that all peoples of the earth may know Your name and fear You, as do Your people Israel, and that they may know that this temple which I have built is called by your name (1 Kings 8: 4143). Even them I will bring to My holy mountain, and make them joyful in My House of prayer. Their burnt offerings and their sacrifices will be accepted on My altar; for My house shall be called a house of prayer for all nations (Isaiah 56:7). 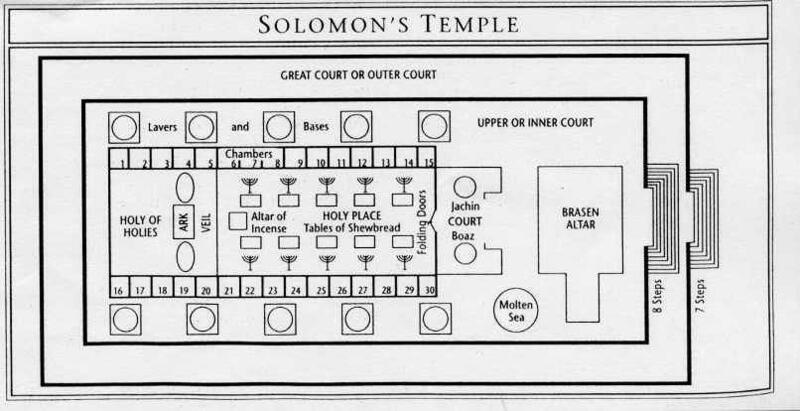 The on-going, intensive research now being conducted by The Temple Institute, and other groups in Jerusalem, will soon bring us more published and accessible information on the Temple of Solomon. Until now most of the published descriptions of the temple have been based on the Bible only. Extra-biblical sources (Ref. 2) describe the Sanhedrin, the Supreme Court of ancient Israel as being housed in a special building in the Temple courtyard named the Chamber of Hewn Stone (Lishkat ha-Gazith). We have descriptions of the ritual bath (mikvah) used by the high priest. The mikvah was supplied by flowing ("living") water from the spring called Ein Eitam which is in the hills of Bethlehem near the Pools of Solomon which are still extant. The spring was 23 cubits above the level of the Temple court. Two chambers in the Temple are named in the Mishnah. One, the Chamber of Secrets, was where the devout placed their gifts in secret. The poor received support from these gifts also in secret. The Chamber of Utensils was also a room for storing gifts from which distribution was made every 30 days. The vaulted Chamber of the Hearth (also mentioned in the Mishnah) was the room the eldest sons could stay and young priests sleep with the keys of the Temple Court in their custody. A fired burned continuously there to keep the occupants warm. Incense for the temple was prepared by a family named Abtinas in the upper story of a special building in the courtyard, the Chamber of Abtinas. We can easily imagine that rooms were needed for wood storage, for extra copies of the sacred vessels, for priestly garment storage, for temple records. Access tunnels came into the temple underground (according to more than one historical account) and some of the storage rooms were underground. These underground rooms and tunnels have apparently not been cleared, entered nor explored since the destruction of Solomon's Temple on the 9th of Av, 586 BC! 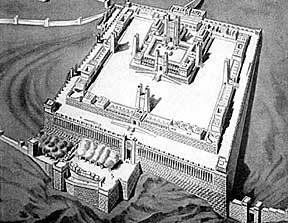 Artist's sketch of the Temple in Jerusalem (probably Herod's enlargement of the Second Temple) looking Northwest. The Fortress Antonia is immediately to the right ot the Temple compound. Solomon's great wisdom and the unrivaled splendor of the First Temple brought pilgrims from near and far. The account of the visit of the Queen of Sheba (2 Chron. 9, 1 Kings 10) tells us something about this great king and the magnificent and holy light from God that blessed him and all the people. Now King Solomon loved many foreign women: the daughter of Pharaoh, and Moabite, Ammonite, Edomite, Sidonian, and Hittite women, from the nations concerning which the LORD had said to the people of Israel, "You shall not enter into marriage with them, neither shall they with you, for surely they will turn away your heart after their gods; Solomon clung to these in love. He had seven hundred wives, princesses, and three hundred concubines; and his wives turned away his heart. For when Solomon was old his wives turned away his heart after other gods- and his heart was not wholly true to the LORD his God, as was the heart of David his father. For Solomon went after Ashtoreth the goddess of the Sidonians, and after Milcom the abomination of the Ammonites. And Jeroboam said in his heart, 'Now the kingdom may return to the house of David. If these people go up to offer sacrifices in the house of the Lord at Jerusalem, then the heart of this people will turn back to their lord, Rehoboam king of Judah, and they will kill me and go back to Rehoboam king of Judah. Therefore the king took counsel and made two calves of gold and said to the people. "It is too much for you to go up to Jerusalem. Here are your gods, O Israel, which brought you up from the land of Egypt. (1 Kings 12:26-28). Because the people felt bound to the legal system of worship in Jerusalem Jeroboam realized the need that worship be centralized in the north. The northern kingdom remained in idolatry until it was overrun and taken captive in 721 BC by the Assyrians. Nineteen kings had ruled over the ten Northern tribes - the Bible has no good thing to say about a single one of them. The dismal record of the lives of Jeroboam I, Nadab, Baasha, Elah, Zimri, Omri, Ahab, Ahaziah, Jehoram (Joram)), Jehu, Jehoahaz, Jehoash (Joash), Jeroboam II, Zechariah, Shallum, Menahem, Pekahiah, Pekah and Hoshea is given in the books of the Kings. Another consequence of Solomon's compromise with idolatry and the resultant spiritual decline was that God raised up an adversary against him, Hadad the Edomite (1 Kings 11:14ff). The result was considerable turmoil in the land and the king's courts. Finally God allowed Pharaoh Shishak of Egypt to come down and plunder the Temple. And it happened in the fifth year of King Rehoboam, that Shishak, king of Egypt came against Jerusalem because they transgressed against the Lord. . . So Shishak king of Egypt came up against Jerusalem and took away the treasures of the house of the Lord and the treasures of the kings house; he took everything. He also carried away the gold shields which Solomon had made. (2 Chronicles 12:2, 9). The temple would now continue to decline and wealth and splendor and importance for the next 367 years. The two southern tribes of Judah and Benjamin, retaining the Temple and its sacrifices as the center of their national and corporate life, were to experience the reign of 20 kings. Fortunately several of these rulers turned from the ways of their forefathers and followed the God of Israel. When they did so, the nation enjoy a season of revival and divine blessing with a temporary respite from the general downhill course that characterizes all of human history in every nation. Judah's kings - Rehoboam, Abijah (Abijam), Asa, Jehoshaphat, Jehoram, Ahaziah, Athaliah, Joash, Amaziah, Azariah (Uzziah), Jotham, Ahaz (Jehoahaz), Hezekiah, Manasseh, Amon, Josiah, Jehoahaz II (Shallum), Jehoiakim (Eliakim), Jehoiachin (Jeconiah), and Zedekiah (Mattaniah) - were mostly individuals who lived out their own self-centered and personally-ambitious lives in indifference to the calling of the God of Israel. A few wonderful exceptions stand out. Some few of these rulers are noteworthy for their influence on the temple, for good or for ill. He also brought into the house of the Lord the things which his father had dedicated, and the things which he himself had dedicated: silver and gold utensils (1 Kings 15:15). 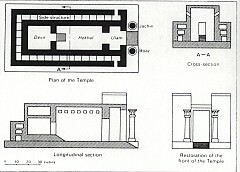 In his earlier years Asa followed the ways of the Lord and renewed the altar in the inner court. However, when Baasha, King of Israel made war against Judah, Asa collected all the treasures and sent them to Ben-hadad of Damascus. By sending the treasures of the Temple this sealed an alliance with him against Israel (1 Kings 15:18-20.). Asa was rebuked by God's prophet Hanani for his alliance with Syria (2 Chronicles 16:7-9). Since the temple vessels were all precisely specified by the Lord for purposes of teaching Israel about themselves and their personal relationship with their God the contents of the temple were not to be altered or modified. ...Joash decided to restore the house of the LORD. And he gathered the priests and the Levites, and said to them, "Go out to the cities of Judah, and gather from all Israel money to repair the house of your God from year to year; and see that you hasten the matter." But the Levites did not hasten it. So the king summoned Jehoiada the chief, and said to him, "Why have you not required the Levites to bring in from Judah and Jerusalem the tax levied by Moses, the servant of the LORD, on the congregation of Israel for the tent of testimony?" For the sons of Athaliah, that wicked woman, had broken into the house of God; and had also used all the dedicated things of the house of the LORD for the Baals. So the king commanded, and they made a chest, and set it outside the gate of the house of the LORD. And proclamation was made throughout Judah and Jerusalem, to bring in for the LORD the tax that Moses the servant of God laid upon Israel in the wilderness. And all the princes and all the people rejoiced and brought their tax and dropped it into the chest until they had finished. And whenever the chest was brought to the king's officers by the Levites, when they saw that there was much money in it, the king's secretary and the officer of the chief priest would come and empty the chest and take it and return it to its place. Thus they did day after day, and collected money in abundance. Amaziah did what was right before the Lord, "but not with a blameless heart" (2 Chr. 25:2). During a civil war with Joash, King of Israel, Amaziah ignored the advice of God's prophet. But when he was strong he grew proud, to his destruction. For he was false to the LORD his God, and entered the temple of the LORD to burn incense on the altar of incense. But Azariah the priest went in after him, with eighty priests of the LORD who were men of valor, and they withstood King Uzziah, and said to him, "It is not for you, Uzziah, to burn incense to the LORD, but for the priests the sons of Aaron, who are consecrated to burn incense. Go out of the sanctuary; for you have done wrong, and it will win you no honor from the LORD God." One of the worst kings of Judah was Ahaz. He desecrated the Temple and robbed it of its treasures. He sent the Temple treasures along with his own to the Assyrian monarch Tiglath-Pileser III to secure his aid in an alliance against Israel and Syria. Ahaz went to Damascus and had a copy of their altar made and brought to Jerusalem. There he placed it before the altar of the Lord and made a sacrifice on this pagan replica. He also closed the Temple and broke up the vessels. These actions represented a terrible profanation of God's holy temple. Ahaz also took the silver and gold that was found in the house of the LORD and in the treasures of the king's house, and sent a present to the king of Assyria. And the king of Assyria hearkened to him; the king of Assyria marched up against Damascus, and took it, carrying its people captive to Kir, and he killed Rezin. When King Ahaz went to Damascus to meet Tiglath-pileser king of Assyria, he saw the altar that was at Damascus. And King Ahaz sent to Uriah the priest a model of the altar, and its pattern, exact in all its details. And Uriah the priest built the altar; in accordance with all that King Ahaz had sent from Damascus, so Uriah the priest made it, before King Ahaz arrived from Damascus. And when the king carne from Damascus, the king viewed the altar. Go up to Hilkiah the high priest, that he may count the money which has been brought into the house of the Lord, which the doorkeepers have gathered from the people. And let them deliver it into the hand of those doing the work, who are the overseers in the house of the Lord; let them give it to those who are in the house of the Lord doing the work, to repair the damages of the house. (2 Kings 22:4, 5). Hezekiah opened the doors and restored the vessels which Ahaz had put away. Unfortunately Hezekiah was limited up with pride and made alliances with foreign nationsand he unwisely showed the treasures of the temple to the Babylonians. His careless actions assured the eventual downfall of Jerusalem. (2 Chronicles 32:24). Manasseh built idolatrous altars in the Temple Courts and placed a graven image in the Temple (2 Kings 21:3-9, 2 Chron. 33:2-9). God punished him by sending him to Babylon as a prisoner in chains. Though he was the most evil of all the kings amazingly he repented while in Babylon and turned to God after which he returned to Jerusalem where he repaired the altar (2 Chron. 33:14-17). His son Amon followed in the idolatrous example of his father. He worshiped an image of his father. After two years his servants assassinated him. The people then killed the assassins and made Josiah king. Josiah took the throne at the age of 8 and at 16 years of age he set out to bring spiritual reform to the whole land. A significant reformation took place under his rule. Josiah ordered the Temple repaired. The stone work was repaired and certain timbers replaced. Josiah removed the idols from the Temple and restored two of the temples courts. He also had the Ark of the Covenant put back into the Holy of Holies (2 Chron. 35:3). The people, however, did not truly turn to the Lord in repentance in spite of the thirty-one year reign of this vigorous and godly reformer. The reign of Jehoiakim was the beginning of the end for the Southern Kingdom. Nebuchadnezzar king of Babylon made this man a vassal king. After three years Jehoiakim rebelled and Nebuchadnezzar laid siege to the city. (2 Kings 24:1). Jehoiakim's son Jehoiachin (Coniah) also did evil. The Temple vessels were taken to Babylon while Jehoiachin and his family were taken prisoner along with the thousand captives including the skilled craftsmen. Only the poorest of the poor remained in the land. And the whole land [of Israel] shall be a desolation and an astonishment, and these nations shall serve the king of Babylon seventy years. Then it will come to pass, when seventy years are completed, that I will punish the king of Babylon and that nation, the land of the Chaldeans, for their iniquity,' says the Lord; 'and I will make it a perpetual desolation. (Jeremiah 25:12, 13).